It’s not even the law yet, but state Attorney General Phil Weiser is already telling sheriffs to resign if they follow locals laws passed in 26 counties that declared themselves 2nd Amendment sanctuaries. “Any commission that says ‘I don’t want my sheriff upholding an unconstitutional law,’ they’re on solid ground,” Weiser said, adding that he expects the question to go before a court. 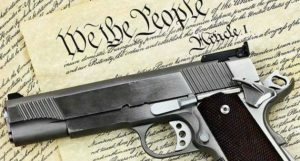 But Weiser, whose job it is to defend Colorado statutes, says he believes that if the red flag bill becomes law as expected and is challenged, it will be found to be constitutional and therefore must be enforced. So county commissions passing the sanctuary laws and the sheriff’s following that order, are totally within the law to thumb their nose once the state bill becomes law, Weiser concedes. And the bill is certain to become law, once it skips through a second state Senate panel and floor passage, and Gov. Polis signs it. But the sheriffs have wiggle room until the constitutionality is tested in what could be a lengthy court battle. Until then, El Paso County Sheriff Bill Elder says he will stick to his oath of office, in that order. Just a friendly reminder, House Bill 1177 is sponsored by House Majority Leader Alec Garnett of Denver and state Rep. Tom Sullivan of Centennial, with state Senate President Pro tem Lois Court of Denver and state Sen. Brittany Pettersen of Lakewood, all Democrats.